A high-pressure gas line running through a landfill site near Lewiston, NY presented a challenge to the landfill owner, Modern Landfill of Model City, NY. The original plan of moving the gas line to meet the capacity needs of the landfill was quite onerous, and warranted a fresh look. The traditional method of an earthen berm was explored to separate the landfill from the gas line, but that would result in a significant reduction in available landfill capacity. How could they meet the full capacity needs for the landfill while minimizing the footprint? Modern's engineers and representatives from Strata Systems worked together to design a .5:1 Mechanically Stabilized Earth (MSE) berm near the gas line allowing the landfill to have the full capacity with a smaller footprint. Several different products from Strata Systems would be used to reinforce the soil for the berm. First GPS-equipped bulldozers owned by Modern prepared a level base. The front of the wall was stabilized with Strata welded wire forms filled with different sizes of rock. The rock-filled wire forms provided stability and sediment-filtering for the front face of the wall. Once the forms were placed, the Stratagrid was laid back into the reinforced soil mass. Support struts were added to ensure facia stability, and the fill was compacted in 9-inch lifts. Strata's SG350 and SG500 were used for the primary reinforcement. Strata's lighter weight SG150 was installed for secondary reinforcement in fill lifts in between the primary reinforcement. Strata Microgrid was also used to reinforce the soil. 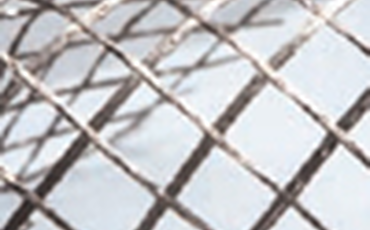 Microgrid is a finely-knitted polyester, saturation-coated geogrid with an open structure. It provides excellent interlock with soils while maintaining high permeability. Microgrid is precision knitted with diagonal 'stabilizer' tie yarns and impregnated with a proprietary coating, resulting in a stable finished product that is easy to handle and install. Microgrid is a biaxial geogrid, with equal tensile strengths in both the machine (MD) and cross machine direction (CMD). The project began in 2012 and about one-third of the MSE berm (1,000 feet) was completed during the summer construction season. Modern was able to maintain the permitted landfill area and capacity without the need to move the high-pressure gas line.